Doggiebox is a percussion sequencer (virtual drum machine) designed for musicians of all stripes. Whether you want to quickly produce a demo, or work out an intricate backing track as you develop a song, Doggiebox is the ideal tool to fill that gap! You don't need to have any training in music theory to use Doggiebox. But if you do, you will appreciate the flexibility you have with time signature, tempo, and rhythmic basis throughout your songs. The Doggiebox User's Guide will walk you through the Doggiebox experience in more detail. All sounds are fully customizable (you can record your own), and pieces of unlimited length can be edited in any number of tempos and time signatures. 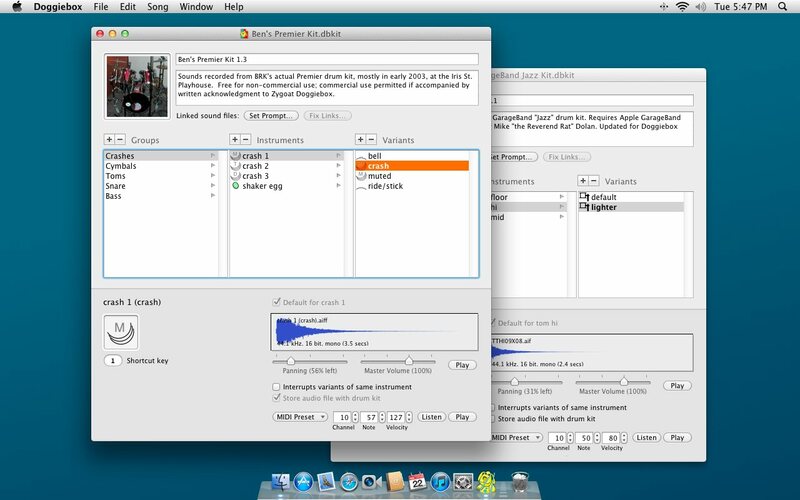 When a song is ready, you can export it to one of several standard audio file formats (including AIFF and WAV) for use in other programs—or play it back in real time to a MIDI hardware device or application. Doggiebox comes with several pre-configured drum kits representing a variety of styles and sounds. 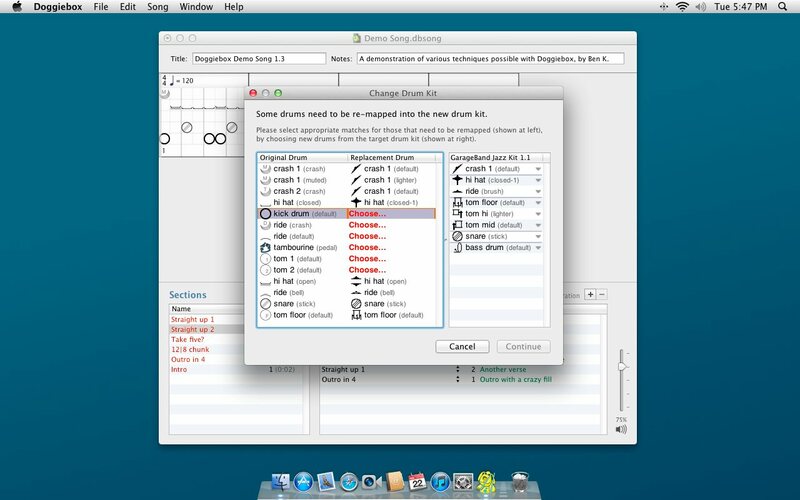 All aspects are adjustable, including the instrument names, key shortcuts, graphical icons, and of course the drum sounds themselves. Hear for yourself how Doggiebox can fit into the mix! Click on the MP3 demos to the right. Both tunes were composed, performed and recorded by Mike Carlyle (Massachusetts, U.S.A.). He played the guitars and bass, but left the drums to Doggiebox! Download a trial version of Doggiebox and get started on your next song within minutes. Man, do I love my puppy :-) Doggiebox has become my #1 song arrangement tool. I use it to figure out the internal logic and arrangements of my songs, and then I export the drum parts into my sequencer program. —Tor L.